Home » Natural Ingredients » What Are Hops? 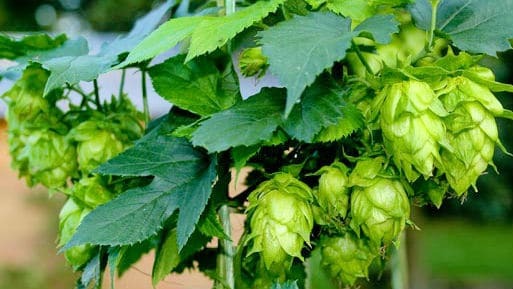 Hops are the seed cones (female flowers) of the hop plant Humulus Iupulus. Hops are well known for their use in the making of beer in which they are used to flavor and stabilize the drink. But hops are also used for many health-based reasons in other drinks and medicines. Hops have a bitter or tangy flavor and share genetics with other herbs and flowers such as the dandelion, marigold, and heather. The hop plant itself is a climbing plant and they are grown in fields called hop gardens or hopfields where they grow up strings. Due to their use in beer, many varieties of hops are grown throughout the world—with different types used for different styles of beer. However, hops are normally identified via their geography and the various species grow on nearly every continent around the globe. However, hops are most common in Germany, the United States, and China. Hallertau in Germany boasts the largest area of hop-growing land in the world. What Are Hops Used For? As mentioned, hops are primarily used in the making of beer and that’s because hops are some of the most unique plants around. The flower has an antibacterial quality to it and that has made it effective for use in medicinal purposes as well as for the brewing of beer. In beer there are two main hop types: aroma and bittering. Besides the flavor enhancements that hops add to beer, the main purpose is for the aforementioned antibacterial effects which allow the activity of yeast while inhibiting undesirable microorganisms that could spoil the beverage. Other herbs that were once used in the making of beer were discarded when beer-makers realized their beverage was less prone to spoilage when hops were used. The stalks of hops are wood-like and can be eaten if prepared properly as a great source of fiber. Additionally, hops are used in other beverages such as the Swedish-soft drink Julmust and in some herbal teas. The medicinal benefits of hops are numerous as well but it’s been mainly used as a relaxant for ailments such as sleeping disorders. In fact, pillowcases filled with hops are sometimes given to insomnia patients. Another hops benefit is for soothing gastrointestinal problems as hops have properties which aid with digestion and intestinal health. Persons with gastrointestinal issues typical incorporate hops into their diets. What Are the Health Benefits of Hops? One of the most studied and applied uses of hops other than beer is to help aid sleeplessness. 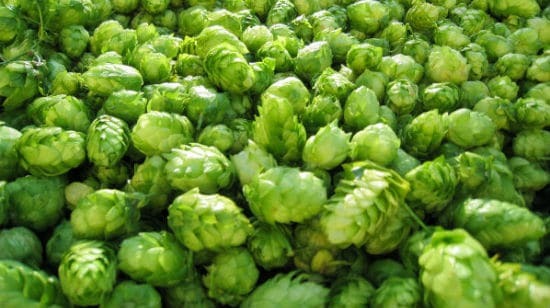 The chemical lupulin is prevalent within hops and is the main reason hops are added to the diets of persons with sleeplessness. An added health benefit of hops is that the lupulin can also help with nervousness, hot flashes and migraine headaches which are common for menopausal women. 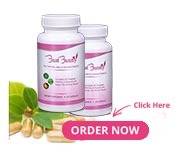 Bust Bunny added hops in each capsule to help relieve menopausal symptoms, get your order today for 10% off using coupon code “hops” or CLICK HERE to have it instantly applied. Another benefit of hops is to help fight vaginal dryness and all the symptoms associated with it like itching, burning, and vaginal rashes. So if you’re looking to increase your breast size while lessening the effects of menopause on your body, then the hops contained within Bust Bunny will greatly help you! What Are the Side Effects of Hops? Much like Watercress, hops are a natural plant with many health benefits. However, like with anything, they should be consumed with caution. If depressed, hops could make it worse and should be consumed in moderation. Additionally, there are chemicals in hops that promote estrogen, which is great for Bust Bunny customers, but could be detrimental to persons sensitive to those hormones, such as breast cancer patients and those with endometriosis. How Do Hops Make Breasts Bigger? 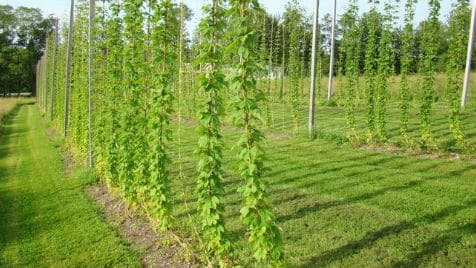 As stated above, the hops in Bust Bunny stem from the female portion of the hops plant. That means hops contain phytoestrogens—the plant version of estrogen. More specifically, the phytoestrogen contained in hops is known as 8-prenylnaringenin. In beer, there is a very negligible amounts of 8-prenylnaringenin due to the brewing process (not to mention beer might make other parts of your body bigger), but the hops found in Bust Bunny possess the proper amount of 8-prenylnaringenin to promote healthy breast growth! In scientific terms, ingesting the 8-prenylnaringenin found in hops promotes prolactin which increases estrogenic responses in your body. These responses, aside from the health benefits listed above, encourage healthy breast muscle and tissue growth in women. With hops being an ingredient in Bust Bunny Breast Enlargement capsules, most women will see a noticeable change in their bust size. The plant is all natural, and is considered safe by the FDA (it is listed on their Generally Regarded as Safe list, or GRA). Hops have been used to assist women for many years, and will aid in your breast growth journey. We want to offer you 10% off to help you on the beginning of your breast enhancement journey. Use coupon code: “hops” or CLICK HERE to have it instantly applied.